Schistosomiasis (also known as Bilharzia) is a parasitic disease caused by flatworms. Larval forms of the parasites are released by freshwater snails in untreated water (lakes and rivers). They burrow through the skin of people who are in contacted with the contaminated water. The lavae make their way to the lungs and liver to mature into adult worms. These worms deposit large volumes of eggs in the blood vessels surrounding the bladder or intestines causing disease. This disease often shows no symptoms so can go undetected for months and years causing serious health problems. The parasite can be contracted when swimming, bathing, wading or undertaking water sporting activities in contaminated freshwater (streams, lakes and rivers). Infection cannot be contracted in saltwater such as the sea. The greatest risk is in many countries in Africa, in particular sub-saharan Africa. It is also present in parts of central and South America as well as some countries in Asia including Laos and Cambodia. 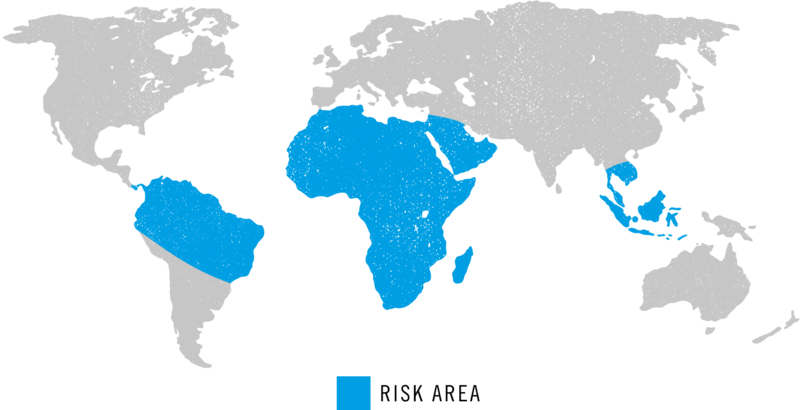 Some countries in Asia including Laos and Cambodia have Schistosomiasis. In Europe it is known to be present in some areas of France. There is no vaccine or any drug available to prevent infection. Avoid all skin contact with fresh water in countries of risk and avoid engaging in activities in these waters including diving, sailing and windsurfing. Avoid drinking infected water and showering in nearby lodges. Wear waterproof footwear if possible.